Another evening, another boat. 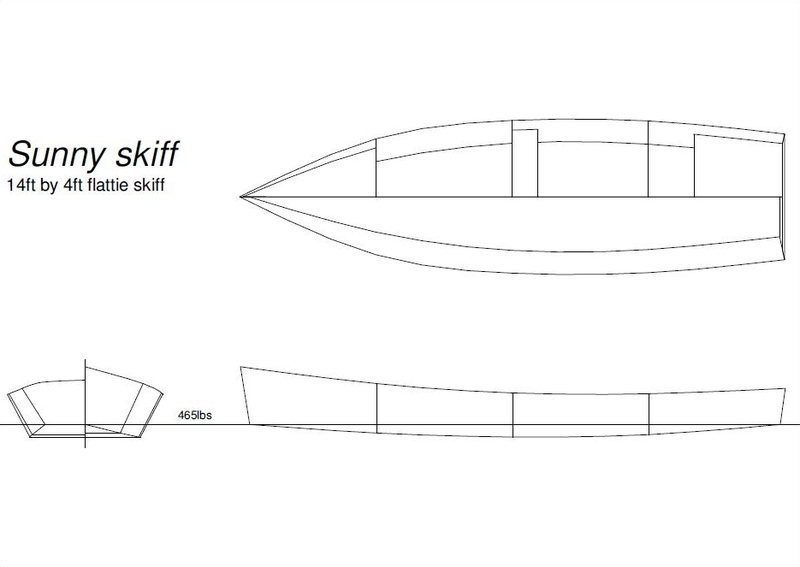 Here’s a set of fairly basic but functional plans for building a 14ft lightweight flattie, the Sunny skiff. Download them here. I think they could be just what many people are likely to want – a boat big enough to be comfortable for an outing for two, small and lean enough to row reasonably well, and a good size for building in a small garage or shed. Like the Julie and Ella skiffs the drawings present a rather basic boat – one can build simply or add gingerbread such as beautifully varnished breasthooks and knees, gapped inwales and the rest at will. Like this boat? Send your comments to gmatkin@gmail.com. I’d better add my usual warnings. I am not a qualified boat designer and the Sunny skiff should be regarded as an experimental design. The designer of the Sunny skiff accepts no responsibility for any loss or damage that may occur during building this boat or in its use. You build it and use it at your own risk. The Sunny skiff is intended for use on flat sheltered water with no strong currents. It is not intended for use with outboard power. If you do decide to build this boat please build a model first and send me photos of your model and the completed boat, together with a report on how the project goes and how the boat performs on the water. Whenever I am available, I will be very happy to provide help and advice if needed along the way; if I’m not around, the online forums can be very useful, but it often helps to search the archives before posting a question. Finally please use the comment button to let me know what you think. This collection of elegantly simple skiffs with classic hullforms seem to me to have a lot to ‘recommend them. What developments, options etc would you look for, bearing in mind that these are not outboard skiffs? For more on the Sunny skiff, click here. Looking for something smaller? See the Ella skiff. Looking for something longer and faster? See the Julie skiff. Gavin, I've printed out your Sunny Skiff plans and I'm working on the model. I've built a few skin-on-frame kayaks and a Herb McLeod One Sheet Skiff — I started a Bolger Brick but it's just too ugly to finish. The other boat had external chine logs and I used PL Premium glue with stainless screws. Have you had any success with that process or are you a faithful stitch and glue guy?? If you think I should stick with stitch and glue — can I use polyester resin??? I'm delighted you're interested in this design. Do please send me some shots of the model and let me know how it went together! A lot depends on how you want to use the boat and the other materials you plan to build into it. There's little sense in using cheap glues and gloops with expensive ply; ditto, it's not the best use of materials to use cheap ply with expensive gloops and glues, although some argue that it's ok to encapsulate bad ply. PL Premium is clearly ok for cheap, trashy smal boats, but as you go up the scale I think you quickly reach the point where your investment in time and materials makes sticking with PL a less good choice. Polyester may well be a good middle way – but I've never used it so can't comment from experience. However, I'd guess that if it's good enough for Dynamite Payson, it's probably good enough for us. I want to make a kayak. pls send me how to make it. I have just printed of the plans for the sunny skiff are there any more details and also a list of sheets of ply and the amount of sheets and the thickness . It looks a super boat and I will enjoy building it. I'd build it from 1/4in ply in most situations, but if it was going to have a hard life and didn't need to be moved much might go 3/8ths. The number of sheets you see on the drawings is the amount of this ply you need. I haven't specified how much epoxy should be involved because I find everyone's mileage varies enormously – those working in countries where epoxy is relatively cheap, such as the USA, often use far more in making a boat than we do in Europe. Please either join the Yahoogroup gmaboatbuilders or email me directly at gmatkin@gmail.com and I will be very happy to assist. Beautiful, practical looking little skiff. It, along with Ella, reminds me of the small commercial fishing skiffs used here on the NC Outer Banks for years to catch shellfish, crustaceans and mullets in particular. They did a lot of waterfowling as well. Your boat looks both pretty, easy to build and practical. I can’t believe that there aren’t already a fleet of them being built in every port! The older ones here had rockered bottoms, like yours, for sailing and rowing. The later ones were flat fore and aft, with no rocker, for an outboard, usually with 3/8″ ply for the sides and 1/2″ or 5/8″ ply for the bottom. Nice design!! Thanks Mitchell. I’d love to see a few more Ellas, Sunnies and Julies built. Up to now the score is a few Ellas only, no more than two or three Julies – and no Sunny skiffs at all. skiff, I plan to make a model this weekend,and if all goes to plan I will send you a photo or two. As a complete novice I have no experience of the stich and glue technique that you advise to use. Do you have a link to a site that goes into more detail.? Also I have seen people use bathroom silicone sealent to waterproof their crafts, any comment on this.? I am thinking of building your sunny skiff. I am currently 3/4 of the way through a PDGoose build but I would like something sleek and slippery to row on the upper Thames. I am constrained by a ridiculously (zero car) garage so i am entertaining the idea of making a two or three section skiff. Do you think sunny would be an appropriate hull? I am currently making a cardboard model; I did a pointy skiff yesterday and I will do an ella at the weekend but overall I am drawn to the longer hull. I am really please to see 14ft Sunny Skiff’s detailled draws, But still missing a builder manual to see construction steps. Also the material list such as screws, nails, glue, epoxy etc. to purchase. I really appreciate your willing to assist your fans. Gavin – need to make a matched pair of “tenders”…liking your “sunny skiff”. Have to check distance between presently mounted davits. An original “canvassed” tender is still aboard the historic boat I am helping restore, but the tender is both too fragile and too “precious” an artifact to put to direct use. I’ll be making twins, and it looks like it’s down to this or Devlin’s “pollywog”. Both are very elegant in lines. The Ella is a lovely little craft, but may be too small. You really build these with 1/4″??? I love the idea of low weight on the davits. I’d say good quality 1/4in is fine for most purposes, but tenders do have particularly hard lives – so 3/8ths might be a longer-lasting choice. I came across this site while searching for a nice free design to build a boat for a sea shore hunting trip. I really like your designs, they all seem very fun and easy to build. I wish one of them was a V bottom which would be better for wavey seas.